We could not be more proud of our addition of Delta. 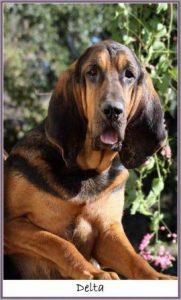 She is a Rib Mountain bloodhound, directly from Jerry Yelk. We are so honored to be able to carry on the Rib Mountain lines through Delta. She is a beautiful girl with the drive we look for in our tracking/trailing dogs. Delta was out of the very last litter Jerry Yelk produced. It is in his memory and honor that we are able to carry on his Rib Mountain lines through Delta. It is with great sorrow to lose Jerry on August 30th, 2014. He will be greatly missed by the trailing community and the many lives he helped save in his many, many years of working his wonderful hounds.